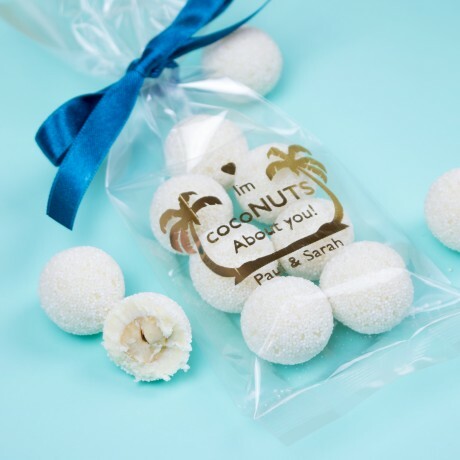 A cute bag of White Chocolate coconut truffles with personalised name(s). Great for weddings, birthdays, valentines day and other occations throughout the year. Luxury White chocolate infused with fresh coconut coats a piemonte hazelnut, then finally decorated with tiny white pearls. This gift can be personalised with the name or nickname of your loved one (the one you're nuts about) or simply with both of your names. This is printed onto the bag with gold metallic foil print. White chocolate, (sugar, cocoa butter, whole milk powder. Emulsifier: soy lecithin, natural vanilla flavours. Hazelnuts. Sprinkles (Sugar, Corn starch) Grated coconut 9.9%, maltodextrin, Thickener: Gum arabic.